LOVING THIS SCARF! You are hot hot hot! You look fierce! I love the scarf! Braids look so good on you! I love braiding my hair to one side, but my layers on the opposite side ALWAYS fall out. Gahh! I'll do a review on Nair after I test it out, thanks for the sweet comment! a color-blocked circle scarf?!!? what, what? how awesome is this! I can't believe you found something so cool!! :) And I'm loving your beautiful lace top. When I think lace, I think of black or white, but this gray is just lovely! i love ALFANI clothing @ macy's. you look too cute here! the hat is a nice touch and i love the bf jeans on you. thanks again for all the blog love. xoxo! 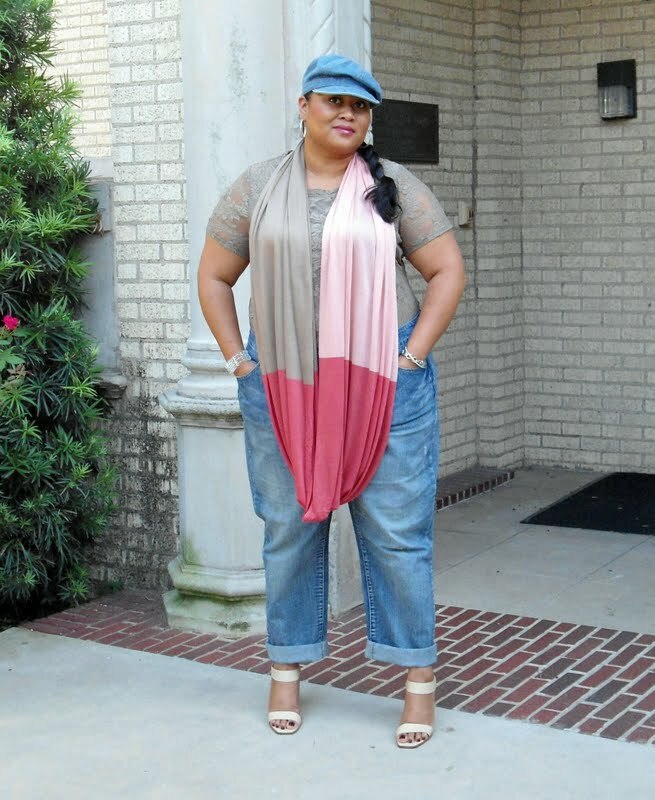 Ok I'm going to need for u to send me that scarf and blouse...stat! I love how you are wearing those jeans. every time I try something like that I never feel I look good enough. You look effortlessly good. Such a pretty scarf! Girl, you know you can rock the heck out of a hat!! My goodness!! Alright, now you betta WERRK that color block!!!! 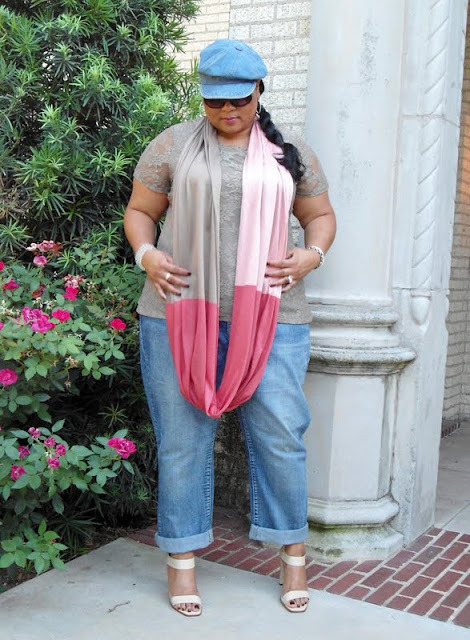 Love that scarf diva and you are workin that hat! Cute! Awesome your casual outfit. Love the scarf ( very nice) and the hat. Love your scarf!! It looks like it is one of the those classic go-to pieces!! gorgeous look kiah! i'm loving the lace top. You always manage to surprised me. Love that scarf, and you. 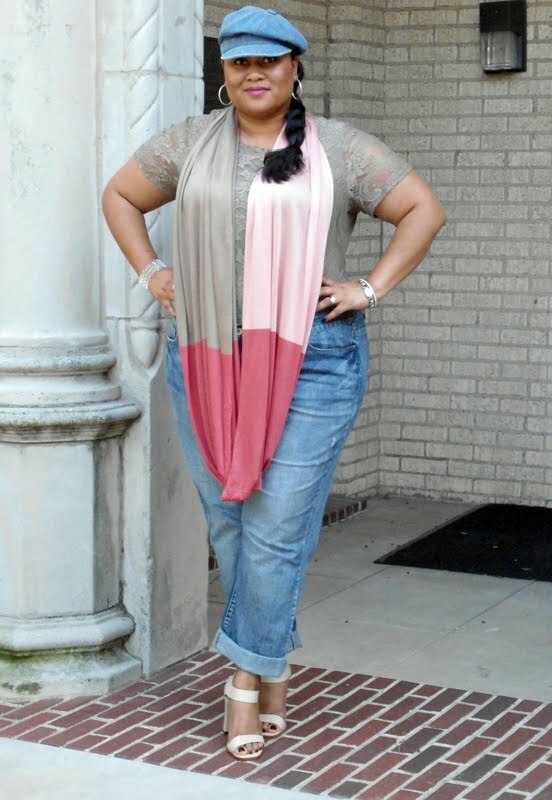 Love the jeans with the lace top. It really changes they way they look. I always feel a bit casual in relaxed jeans but this really lifts them. Will be stealing your look. the fit is definitely cute but with that scarf its poppn! Ohhhh yesss, this is totally the cutest outfit ever! I love how you paired up those pretty heels w/ the jeans. You look so chic and chill at the same time! Girl I LOVE this outfit especially the scarf!!!! One of THEEE collest casual looks I have ever seen. You have done it so well. If you don't know my friens Becks at oomph. Check her blog. http://rockoomph.blogpot.com. I tthink you will love her steal and have many secrets to steal.